Join us Sunday April 21, 2019 for our annual Easter brunch celebration! Chef Ruiz and Leslee Miller of Amusée are back! Join us for our 12th year celebration. Their combined love of food and passion for wine, will keep you engaged throughout the evening. You will not find a better pairing of food and wine than Hector and Leslie's. Join us for a night you won’t forget. Cafe Ena will be preparing a special four course dinner featuring Mole Sauces of Mexico! We will be joined by our dear friend, Holly Wing of DeMaison Selections. DeMaison is a boutique importer, best known for its impeccable lineup of Spanish wines. They have a carefully curated list of small-scale, honest-to-goodness producers who would sooner cut off their right arm than cut corners on quality. Chef Ruiz has created a bespoke menu of Spanish dishes intended to harmonize beautifully with the wines being featured. To secure a reservation, please call us at 612-824-4441 or simply make a reservation online. Hope you can join us! Ready. Set. Cook! Local chefs Gerard Klass (original chef with Crave Restaurant Group) and our own Hector Ruiz are preparing for a head-to-head competition for the coveted title, Master of the Market 2017. The sixth annual COUNTRY Financial Chef Challenge will take place at the Minneapolis Farmers Market on Saturday, August 12 at 10:00 a.m. with Master of Ceremony, Paul Koffy (Morning Drive Host, BUZN 102.9 FM and food lover). After a 20 minute, $50 Market shopping spree, and 30 minutes of cooking, a panel of celebrity judges will evaluate the dishes based on taste, presentation, creativity and adaptability to re-creation at home. Come join us for this special event. Learn new ways of utilizing local produce in your own dishes, cheer on the chefs and enjoy the Minneapolis Farmers Market! It will be a day filled with fun and creativity. "Four Course Pre-Fixe Dinner" paired with a few of his favorite wines at Cafe Ena! Oriol will be sharing his delicious wines from Penedés, Spain. This is a casual event where you choose your reservation time between 6pm & 8pm and Oriol will be in house to answer all your questions. 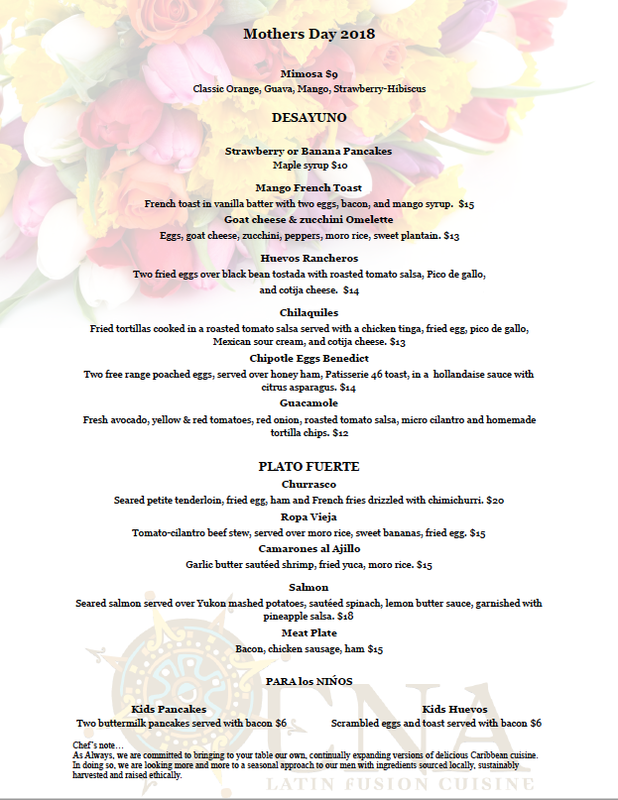 Join us for Mother's Day Brunch May 14th from 9am to 3pm. We will be offering a menu with both breakfast and lunch items.